LeBron has two NBA championships, four MVP awards, his own phone app and — most recently — has created his own limited-edition Sprite flavor dubbed the Sprite 6 Mix. It’s Sprite mixed with flavors of cherry and orange, according to the press release. 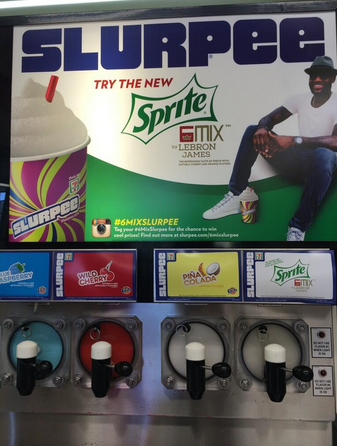 This week 7-Eleven released the special flavor in Slurpee form. Today, I had the chance to try out the drink, and it’s a solid selection. It reminded me of the traditional white cherry flavor, but with a twang of Sprite mixed in. As I was sipping on the slush, my NBA playoffs-obsessed mind wandered to compare the Slurpee flavor to the journey of the current Miami Heat squad. The drink is cold and refreshing — perfect for a hot summer day. Similarly, the Heat are talented and they go hard — a prime team to watch for any fan of the pure game of basketball. At the same time, the Slurpee faintly reminded me of something I’d tasted before, just as watching the Heat succeed has, in my mind, loosely resembled the 2000-02 Lakers. For those three seasons, my eyes were glued to the purple and gold in NBA playoff games. I believed that Lakers team could’ve won eight straight. Now, the Heat are in the same position: They are on the brink of a three peat with endless possibilities ahead. I’ll let tonight’s dominant performance in Game 6 versus the Pacers speak for itself.